The Bonneville landslide is perhaps the second most well known landslide in Washington State, following the 1980 Debris Avalanche of Mt. St. Helens. The landslide was probably first recognized by the Klickitat Nation (also known as the Qwû’lh-hwai-pûm, or loosely translated as prairie people). The landslide is known as the Bridge of the Gods and served as a water crossing for trade routes across the Columbia River. The Bridge of the Gods has many stories of its origin, perhaps the most well known is the story by the Klickitat people. “Native American lore contains numerous legends to explain the eruptions of Mount St. Helens and other volcanoes in the Cascade Volcanic Arc. The most famous of these is the Bridge of the Gods legend told by the Klickitats. In their tale, the chief of all the gods, Tyhee Saghalie and his two sons, Pahto (also called Klickitat) and Wy’east, traveled down the Columbia River from the Far North in search for a suitable area to settle. They came upon an area that is now called The Dalles and thought they had never seen a land so beautiful. The sons quarreled over the land and to solve the dispute their father shot two arrows from his mighty bow; one to the north and the other to the south. Pahto followed the arrow to the north and settled there while Wy’east did the same for the arrow to the south. Saghalie then built Tanmahawis, the Bridge of the Gods, so his family could meet periodically. When the two sons of the Saghalie fell in love with a beautiful maiden named Loowit, she could not choose between them. The two young chiefs fought over her, burying villages and forests in the process. The area was devastated and the earth shook so violently that the huge bridge fell into the river, creating the Cascades Rapids of the Columbia River Gorge. The story captures two important keys to the landslide. A strong shaking and burying of forests and villages. Early research into the Bonneville Landslide places the landslide movement around 1,100AD. However, a recent find of a buried douglas fir log about 150 feet deep in the landslide mass places the landslide failure somewhere between 250 and 400 years ago. This conceivably places the Bonneville Landslide at the 1700 Cascadia Earthquake. This would follow the story of the Klickitat People or great shaking and landslide movement. When the landslide moved, it completely blocked the Columbia River, creating a temporary dammed lake. The waters would have slowly cut through the material, reestablishing the channel. The Bonneville Landslide is part of a larger complex of landslides. The ages are not well constrained and may have occurred with episodic movement through time. The two landslides that are most recent are the Bonneville Landslide (probably failed around 1700) and the Carpenters Lake Landslide (Age Unknown). The two smaller landslides, the Greenleaf Basin and the Piper Road Landslides are more recent, smaller landslides. The Cascade Landslide is composed mostly of debris of the Yakima Basalt, Eagle Creek Formation, and a platy olivine basalt flow (Wise, 1961). The landslide is suggested to have a depth of about 300 to 400 feet and slides on a clay layer at the base of the Eagles Creek Formation. The units are gently dipping southward, which probably adds to the instability of the area. The Cascade Landslide Complex is perhaps one of the more dangerous landslides in Washington State. The Bonneville Dam sits on the landslide debris of the Bonneville Landslide. Major pipelines, powerlines, and transportation routes cross the landslide. Future movements (potentially during a Cascadia Subduction Earthquake) would result in major disruptions in utilities and the potential for the redamming of the Columbia River. The other problem, it might not occur in the Cascade Landslide Complex at all, large landslides dot the area surrounding this area and some might have the potential to also partially or completely block the Columbia River. A damming of the Columbia River would be devastating. The waters would form into a lake, flooding low lying communities, further impacting transportation routes and utilities. The potential exists for the Columbia to then rupture the dam, creating a massive damburst flood. That flood has one major target in its way, Portland. Although this is a very extreme example (and the odds for the events to occur this way are very slim), a large debris flood through the Columbia River would cause unprecedented damage, especially for a landslide. However, chances are future landslide movements would be less extreme, although the likely major disruption of utilities and transportation would be felt throughout western Washington and Oregon. Landslides can be destructive, destroying houses, infrastructure, and kill or injure people. However, we don’t usually think about landslides being bad for your health. Washington State has a complex geology. Much of the western Cascades is made up of accreted terrains , composed of both oceanic and continental rocks. Parts of these terrains contain asbestos (which occurs naturally, despite a relatively large number of people believing it artificial). Asbestos is a fairly blanket term for a wide variety of minerals, some harmless, some very dangerous. The most well known example of the dangers of asbestos can be seen in Libby, Montana, where vermiculite mining with occurrences of fibrous tremolite asbestos caused widespread health problems and death for many of the residences and workers. 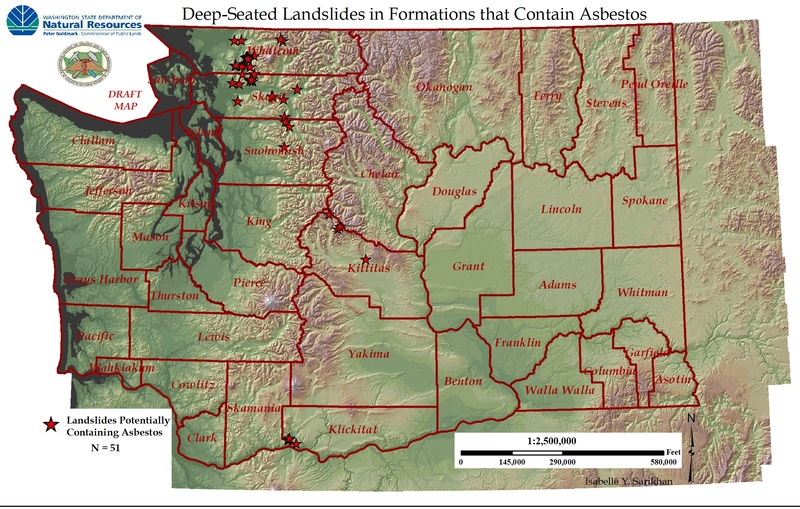 In Washington State, asbestos outcrops across the state. Most of the outcrops are small, uneconomical to mine or develop and probably pose little danger with limited exposure. However, some larger deposits occur in Snohomish, Skagit, Whatcom, Kittitas, and Klickitat Counties. These deposits can cause weakness within rocks and are sometimes associated with weak, friable material, places where we would expect landslides to occur. The prime landslide that contains asbestos in Washington State is the Swift Creek Landslide in Whatcom County. The landslide material is composed mostly of serpentinite, a friable, weak rock in terms of stability with high amounts of chrysotile. Its origin was probably an uplifted oceanic plate that was probably composed of ultramafic material, such as dunite that was then metamorphosed and transformed into serpentinite. The landslide has produced a significant amount of material which has been transported downhill into the valley below, depositing chrysotile laden sediments. These sediments, especially during flood events, deposit in places where people can come into long-term exposure, which can result in long-term health problems. Swift Creek might be the most well known landslide to contain asbestos in Washington State, but since asbestos occurs throughout Washington State, many other landslides have the potential to contain asbestos. 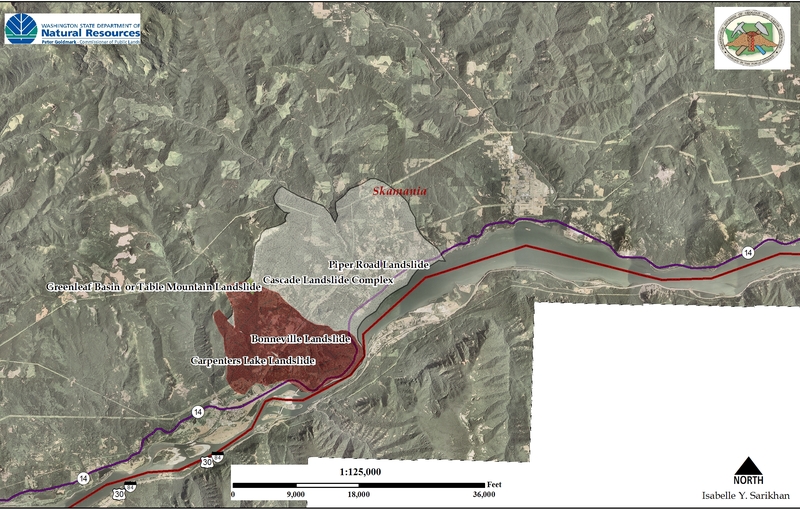 This map represents deep-seated landslides that have the potential to contain asbestos within them. This map is not a perfect representation, as available data is scarce. The map was created by overlaying identified asbestos occurrences found in Bulletin No. 37, Inventory of Washington Minerals (Valentine and Huntting, 1960) with the 100k geologic units (with slight modification on unit selection). The units that were identified with asbestos occurrences were then intersected with deep-seated landslides from DGER Washington’s Statewide Landslide Database (the database is located within the menu). These deep-seated landslides are of all ages, from relict to active. Points were then selected at the centroid of the polygons to create a point file of landslides that potentially contain asbestos materials. It isn’t a perfect method by any means, but it at least gives us an idea that more of these landslides probably exists throughout Washington State. I am in the process of intersecting the landslide layer with ultramafic units known to contain serpentinite, which will help expand and potentially more accurately capture landslides potentially containing asbestos. Valentine, Grant M.; Huntting, Marshall T., reviser, 1960, Inventory of Washington minerals; Part I–Nonmetallic minerals; 2nd edition: Washington Division of Mines and Geology Bulletin 37, Part I, 2nd ed., 2 v.